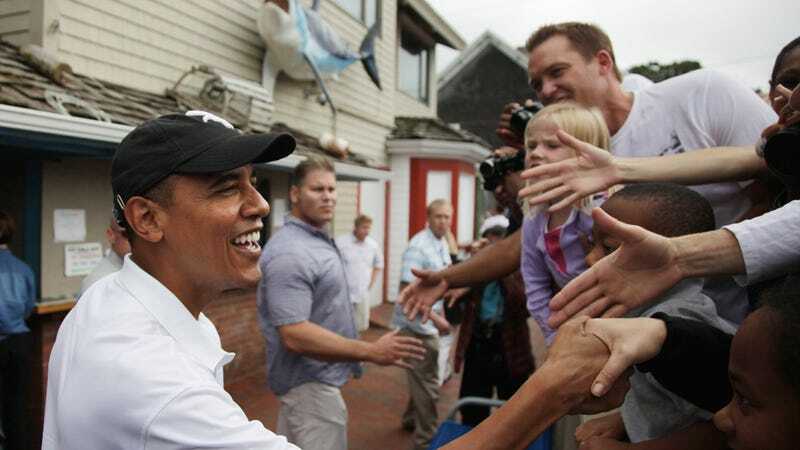 The President is on vacation in Martha's Vineyard right now. Whoo! Or not? Well, however upset/indifferent this makes you, it's doing one amazing thing. Obama has brought the gift of decent cell service to the citizens. It's like Christmas! Martha's Vineyard is known for especially spotty coverage for most of the year. If you go up there you might as well be off-grid, which is one of the reasons why I never go for my own stately vacations. But when the Obama family arrives, the island is suddenly awash with ringing cell phones like a holiday chorus. Why? The two Verizon cell towers the president brings with him are to blame. Many residents and visitors said they considered the few weeks of better connections a kind of gift from the White House. Some described jumping when their phones went off in the library or post office, unaccustomed as they are to hearing them ring at all.